As GE Healthcare Life Sciences scales up its new U.S. headquarters in Marlborough, Mass., WPI is helping some of the company’s engineers beef up their biotech chops. Dubbed BioTech 101, the first of a planned series of WPI training classes was delivered October 14 at GE by Kamal Rashid, PhD, research professor and director of the university’s Biomanufacturing Education and Training Center. 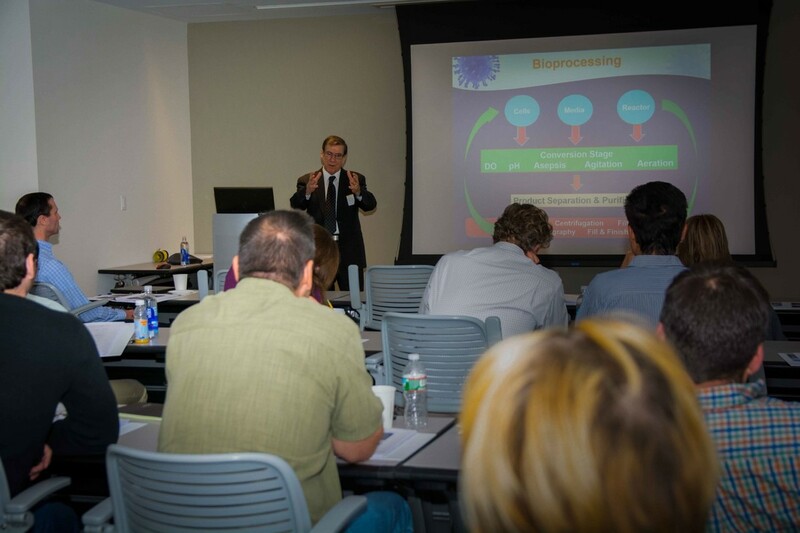 His day-long program, “Bioprocessing Healthcare Products,” gave 20 GE Healthcare engineers an overview of cell biology, cell culture, process scale-up, bioreactors, and other bioprocessing operations. In June, GE leaders joined Massachusetts Governor Charlie Baker to cut the ribbon on the new North American headquarters of the company’s life sciences business unit, which relocated some operations from New Jersey--Business Wire covered this story. When fully staffed, GE expects to employ more than 500 people at the new site. The company’s Xcellerex manufacturing division, which builds single-use systems to make biologic drugs, is located in Marlborough. So the WPI training programs will help “on-board” new employees and also help incumbent GE staff expand their knowledge of bioprocessing and related technologies. Rashid, who has collaborated with GE’s internal Fast Trak training program for several years, says WPI will work closely with GE Healthcare to customize the training curriculum to meet the company’s ongoing needs. “This was a good beginning, and I am happy that it was well received,” he says. In addition to workforce training programs, WPI and GE Healthcare recently launched a sponsored research project analyzing the scale-up of certain cell culture processes in a 200-litre single-use bioreactor.